We provide community workshops, trainings, referrals, consultation, and risk reduction materials to individuals, families, and organizations in order to prevent HIV, Hepatitis C, overdose, and the perpetuation of stigma. To end health disparities faced by those made vulnerable by drug use & other high-risk behaviors in Arizona through harm reduction focused education, advocacy, and evidence-based programming. Removing barriers to facilitate empowerment, health equity, and dignity for Arizonans impacted by drug use. We provide community workshops, trainings, referrals, consultation, and risk reduction materials to individuals, families, and organizations in order to prevent HIV, Hepatitis C, overdose, and the perpetuation of stigma. SPW organizes syringe cleanups and also offers free condoms and naloxone to people at risk of overdose. We rely on a network of committed volunteers and partners throughout the state to improve community health. Opioid overdose happens when the opioid receptors in your brain become flooded with opioids. This causes breathing to slow down to the point of respiratory failure. The good news is that overdoses are preventable. Learn how you can prevent an overdose from ever occurring. 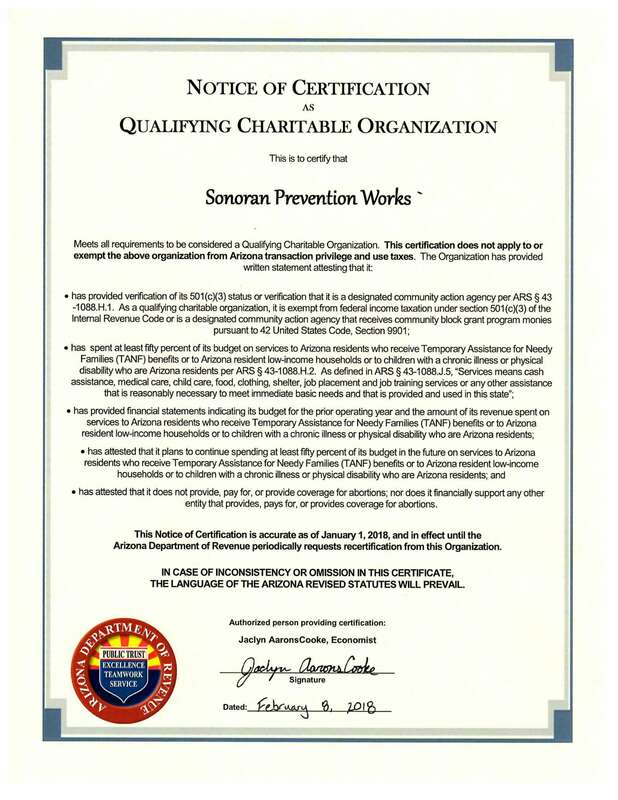 Sonoran Prevention Works is the only comprehensive harm reduction organization that combines direct service, legislative advocacy, and capacity building to create stronger, healthier communities for people made vulnerable by substance use. As a grassroots organization, we depend on your support to help us create change. Please make a tax-deductible donation today. onoran Prevention Works will be hosting a 2-hour community Overdose Recognition, Response, and Naloxone Administration training at Page Public Library, 479 S Lake Powell Blvd Page, AZ 86040 in the Program room From 6:00 to 8:00 PM on Wednesday, April 9th. This is a training geared towards Professionals, those working with People Who Use Drugs, Substance Use Disorder, law enforcement, healthcare professionals, behavioral health and treatment providers, and ALL are WELCOME and encouraged to attend! Sonoran Prevention Works, Phi Theta Kappa and Chandler-Gilbert Community College will be hosting a 2-hour community Overdose Recognition, Response, and Naloxone administration training at Chandler-Gilbert Community College Pecos Campus in the Agave Hall Community Room April 10th, 2019. Sonoran Prevention Works will be hosting a 2-hour community Overdose Recognition, Response, and Naloxone administration training at the Page Public Library, 479 S Lake Powell Blvd, Page AZ 86040 in the Program room from 6:00 to 8:00PM on Thursday April 10, 2019. People who use or have a history of using drugs (prescribed or non-prescription), friends & family members, and ALL members of the community are WELCOME and encouraged to attend! We ask that Law Enforcement attend the training the day before, Page Public Library, 479 S Lake Powell Blvd Page, AZ 86040 in the Program room From 6:00 to 8:00 PM on Wednesday, April 9th. There is limited Space for this training. 25 people. Please email the address at the bottom to register and accept the calendar invitation. Sonoran Prevention Works and Maricopa Behavioral Health Services will be hosting a 2-hour community Overdose Recognition, Response, and Naloxone administration training at the Copper Sky Recreation Complex 44345 W Martin Luther King Jr Blvd , Maricopa, Arizona 85138, Multi-purpose rm A, from 5:30-7:30 PM.